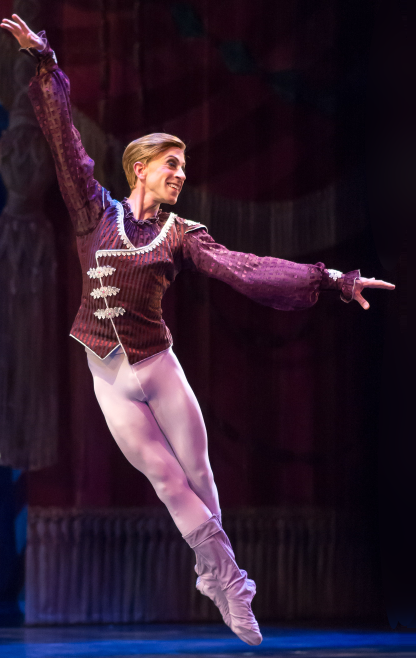 OMAHA — Dec. 18, 2017 — In past years, American Midwest Ballet’s final performance of The Nutcracker at the Orpheum would usher in holiday break for our company dancers. This year, the dancers are heading south for the winter — earlier than our usual tour season — to perform Dec. 29-30 in the Ballet Vero Beach production of Nutcracker on the Indian River. I am dancing Uncle Drosselmeyer and Mother Mangrove in Nutcracker On the Indian River. Drosselmeyer is a bit more eccentric in this production than I’m used to, which makes it fun to explore the character in a new way. He’s definitely mischievous and makes a lot of the magic happen, particularly in the transformation scene before the battle. Mother Mangrove (Mother Ginger in traditional productions) is a challenge…moving on stilts is not easy! My giant skirt is fashioned after the roots and limbs of a mangrove tree. Manatees tend to hang out around/in mangroves, so the little manatees in Act II come out from under my skirt. It’s fun though; if there’s ever a time to be “over the top” with a stage persona, this is it! I’m celebrating Christmas with my fiancé on Christmas Eve with a quiet dinner and a movie. I depart for Vero on Christmas Day, a day earlier than the others, so I can help Adam [Schnell, artistic director of Ballet Vero Beach] and the crew with load-in! The best thing that has happened to me so far this season at American Midwest Ballet is getting to work with Ann Reinking on a lead role in her creation for this season’s Momentum; and for Ballet Vero Beach, it is doing a fabulous new production of The Nutcracker, my favorite ballet.